The individual’s teams work together to identify service needs and desired personal outcomes. Dungarvin Nevada, LLC has been a provider since 2006 and currently provides services to adults with intellectual and physical disabilities in all three regions of the state; Desert, Sierra, and Rural. 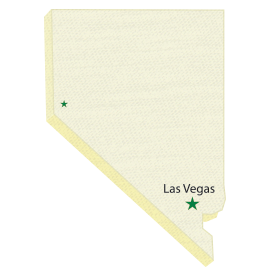 Services are supervised through two offices located in Las Vegas and Reno, Nevada. Dungarvin Nevada works cooperatively with each individual, his or her family, support team and county/state entities to ensure quality services. Specific services and supports that are offered to the individual are determined by his or her personal strengths, preferences, interests, desires, and goals. The range of particular services and supports Dungarvin offers is comprehensive in order to meet the needs and preferences of each person. Dungarvin works closely with the individual in order to achieve their goals and provides advocacy to meet these. The Dungarvin Nevada Team believes that each individual has a right to self-determination working within the framework of the program offerings. Dungarvin Nevada uses Sengistix in a number of locations. Sengistix utilizes a wide variety of coordinated sensors to provide a “complete package” of custom monitoring tailored to meet unique individual needs. This automated sensing provides caregivers the ability to improve safety, enhance the quality of life, and increase options for greater independence for all individuals requiring support. The person receiving supports has greater independence because paid staff is only called to the home when needed. For more information Sengistix, please visit our Partners. We understand that each person is unique and no support model meets the needs of everyone. If you are interested in any of the listed services from Dungarvin, or need more information about current openings or future placements, please contact us! A Host Home Provider provides assistance with Daily Living Skills, Access to the Community, Medical Appointments, and other daily activities. Host Home Providers are highly trained and have rigorous background screenings, similar to an employee you would encounter in a group home. A matching process occurs in order to promote success of placements for longer periods of time. Homes are monitored regularly throughout the month in order to insure that programming is consistent with the needs of the individual living in the home. Only two individuals may live in a host home at a time due to the unique structure of the program and desire to maintain a family home environment. There is no staff turnover that is common in group home settings. There is historical knowledge built over time due to the family and individual’s closeness and living in the same home. Host Home Providers typically are strong advocates for the individual. A family environment is fostered creating a strong bond between the family and individual. There typically are more choices for community inclusion. An individual is not limited to waiting on a group home van or coordinating activities with many roommates. Typically see increased independence for the individual living in the host home. Establishing relationships that are often will last a lifetime.